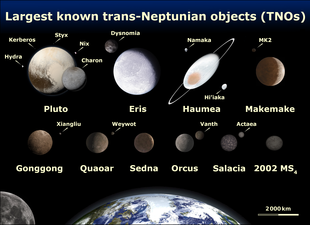 Haumea (minor-planet designation 136108 Haumea) is a possible dwarf planet located beyond Neptune's orbit. It was discovered in 2004 by a team headed by Mike Brown of Caltech at the Palomar Observatory in the United States and independently in 2005, by a team headed by José Luis Ortiz Moreno at the Sierra Nevada Observatory in Spain, though the latter claim has been contested. 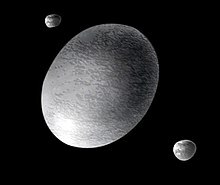 On September 17, 2008, it was recognized as a dwarf planet by the International Astronomical Union (IAU) and named after Haumea, the Hawaiian goddess of childbirth, though subsequent observations caste doubt on its shape being consistent with hydrostatic equilibrium (and thus perhaps not a dwarf planet).